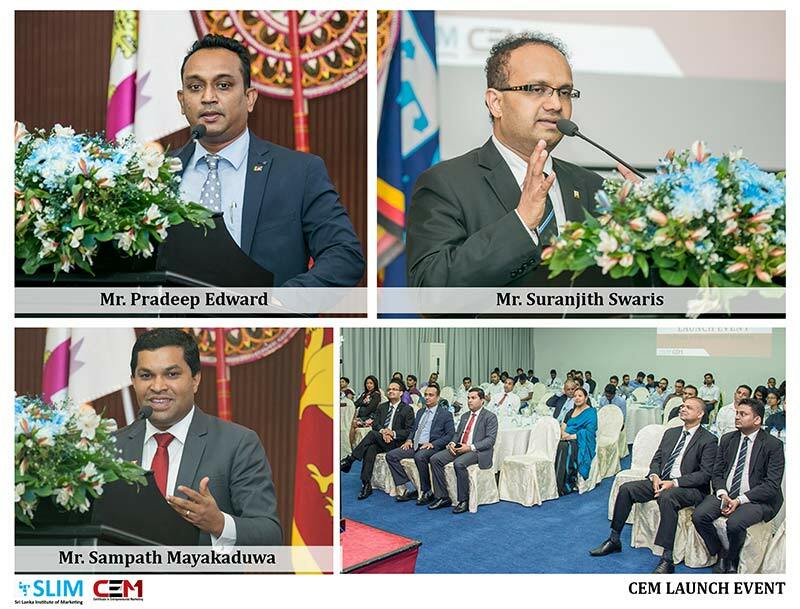 The Sri Lanka Institute of Marketing (SLIM) launched its latest educational program, the ‘Certificate in Entrepreneurial Marketing’ (CEM) on an impressive note at a ceremony held recently at the BMICH, Colombo. The novel program is aimed primarily at increasing the awareness and understanding of the essential applications and relevant tools in entrepreneurial marketing in order to equip participants to compete effectively and efficiently in the market place. It focuses on the strong need to develop tools, principles and theories to help businesses — especially start-ups and small enterprises — to survive and thrive in an increasingly hostile and unpredictable environment. The program fills a long-felt need for entrepreneurial marketing in the Sri Lankan context with the changing economic environment. The specialized program also aims to boost the confidence of aspiring entrepreneurs by tutoring them in the relevant skills essential in such marketing practices. The new program was launched as a five month course with the focus on both theoretical and practical approaches to the discipline. It has been designed to enable start-up entrepreneurs to develop proactive and inventive marketing strategies to enhance the competitive edge for their business. Introducing the ‘Certificate in Entrepreneurial Marketing’ at the event, President SLIM and CEO of Lanka Hospitals Diagnostics, Pradeep Edward stated, “The newest product to our Educational portfolio is specially designed to meet the market requirements for shaping and equipping pioneering entrepreneurs to the market armed with the right marketing skills”. “Throughout the comprehensive research prior to the content development, SLIM identified a significant number of Sri Lankan entrepreneurs who failed in their enterprises as a result of a dearth of proper marketing knowledge. They have had the courage to start up their own businesses but couldn’t sustain the enterprises due to a poor understanding of marketing strategy. Thus the program was launched by SLIM to boost the sustainability and the growth of local entrepreneurs. Through this program SLIM is proud to be able to mould a breed of much needed educated and sensible individuals to the market where entrepreneurship is currently recognized and awarded as one of the upcoming trends in the modern world”. Acknowledging the significance of an education in Marketing in the present context, the guest speaker CEO/Managing Director – Idea Group, Indika Sampath Mayakaduwa stated, “Marketing is a vital part of today’s business world. It helps a business to focus on its strengths, weaknesses, opportunities and threats. It will provide an understanding of buying patterns and attitudes while also exploring the psychology behind certain marketing techniques. Marketing teaches about branding elements to make a brand successful and the various communication tools that can help in that process. SLIM’s Certificate in Entrepreneurial Marketing is a good educational platform where aspiring entrepreneurs will get the opportunity to enhance their knowledge in marketing their ventures”. He also elaborated on his life as an entrepreneur and the start of Idea Group Limited. A venture that started out as a software development company, which provided dealer networking solutions to a major Telecommunication company, duly went on to get established as ‘Idea’, while extending their services towards digital document management. The growth of the organization was well established in a very short period of time and broadened the horizons from its core business to move into new business opportunities in the market, soon becoming a group of companies. At present, Idea Group Limited consists of 20 subsidiary companies which have paved a diversified way to grow and enlarge the group’s strength, while promoting eco-friendly concepts as a Corporate Social Responsibility. Speaking at the event, Anoma Karalliyadde, Director Regional Development of the Export Development Board (EDB) shared her thoughts on the need for more local entrepreneurs entering the market. She elaborated on the role the EDB is playing to help them launch and sustain their businesses through its various activities, programs and forums. Ramal Jasinghe, President of the National Chamber of Exporters of Sri Lanka (NCE) shared his thoughts with the audience highlighting the importance of winning export markets to entrepreneur businesses.